Greater Surface Area – When filtering out chemicals, fumes and odors, it's all about the surface area. 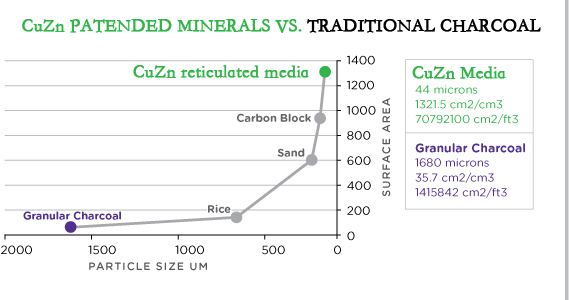 CuZnAir's patented reticulation process creates filtration media that has 50 times greater surface area than traditional granular media. The patented FilterFoam Technology ensures that contaminants are absorbed as they make contact with the powerful filtration media. Greater Contact Time – FilterFoam media creates a torturous path for the smelly, toxic air, increasing the air’s contact time with the media. The porous nature of the reticulated media ensures a high flow rate. Higher Efficiency – Two ounces of the FilterFoam media is equivalent to 1 pound of traditional granular media. This advantage allows the compact systems to perform with large scale industrial capacity. Achieves a 3 to 5 Minute Air Turnover Rate - When right-sized for a space, having the right size and number of units for the pollution levels and room size, the CuZnAir air purifiers can achieve a remarkable three to five minute air turnover, which equates to 100% elimination of odors. 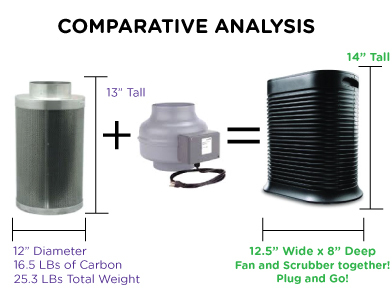 Saves Time and Money – CuZnAir's lightweight, compact systems last longer and outperforms the competition. Their efficient design makes installation easy – simply plug the unit into a wall socket – reducing or eliminating costs associated with maintenance, plus they are EnergyStar.